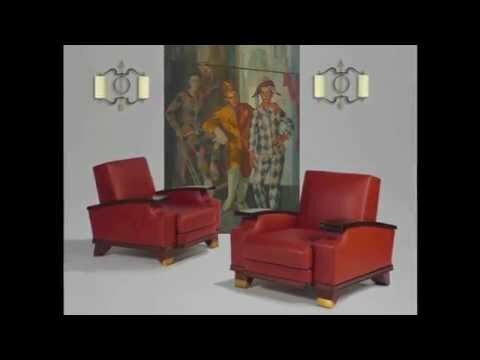 Spectacular and extremely rare pair of armchairs, France, Circa 1945-1950. The base and arms are designed in solid mahogany with gilt brass sockets, reupholstered in a cognac ( light burgundy ) hued leather. This pair of armchairs comes from a complete set of four armchairs and a sofa that we purchased altogether. We are offering this pair separately, while the second pair and sofa will be sold as a set. The set has been authenticated in France in 1992. One chair wears the stamp of "La Compagnie des Arts Francais". Materials / Techniques: Base and arms in solid mahogany, gilt brass sockets. Upholstered in Cognac (Light Burgundy) hued leather.